One can understand why amateur mycology might seem like an unrewarding and slightly odd pastime to the outside observer. There are many who might consider squatting amongst the leaf litter with guidebook in hand, trying to pinpoint whether the flush of slimy brown-yellow toadstools sprouting from a rotting log or tree stump could be Hypholoma fasciculare, Hypholoma capnoides or maybe even Kuehneromyces mutabilis, an ultimately pointless endeavour. Few would deem being able to distinguish Dead Moll’s Fingers from Dead Man’s Fingers or a Leopard Earthball from a Common Earthball among the most vital of life skills. Flicking through the near 300-pages of photos of various specimens contained within Roger Phillips’ comprehensive tome Mushrooms and Other Fungi of Great Britain & Europe might appear to bear out what many would assume to be a self-evident truth: a lot of fungi are rather drab and barely distinguishable from one another, and from a selfishly human perspective, appear to serve no evident purpose. That said, once in a while one stumbles across a species that really sticks out among the thousands of nondescript LBMs (‘little brown mushrooms’) most commonly encountered, and the lure of immersing oneself within the mysterious world of the mushroom becomes more obvious. One such example is the Wrinkled Peach, or Rhodotus palmatus, one of those peacocks of the fungi kingdom whose discovery is not only exciting because they make such enchanting photographic subjects, but also because their distinctive colours and forms make them far easier to identify accurately than most. 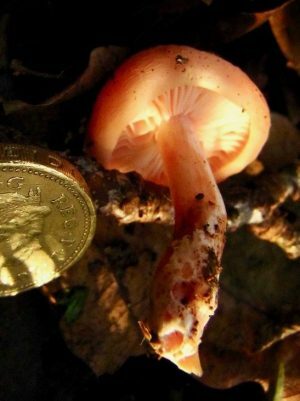 The Wrinkled Peach is one of those rare UK mushrooms whose English common name assigned by British Mycological Society perfectly describes how it looks. It also goes by several equally apt ‘unofficial’ alternatives, including Rosy Veincap and Netted Rhodotus, while the name Apricot Fungus given in my little Collins Gem book Mushrooms (1996) compiled by Patrick Harding makes sense inasmuch that peaches and apricots ultimately look pretty similar. 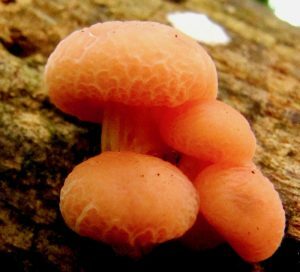 The cap of Rhodotus palmatus is a rather fetching salmon or rosy peach coloured and has a tough upper skin (referred to more technically as the cuticle, or pellicle) covered in wrinkles that in some specimens forms an almost vein-like network. Shelley Evans and Geoffrey Kibby’s Pocket Nature: Fungi (2004) note that this skin is “stretchy and gelatinous; it should peel off with comparative ease”. One notable feature of the cap, which ranges from 4-10cm in diameter and starts out convex before flattening out as it grows, is its in-rolled margins, which curve inwards to form a kind of lip around the gills. 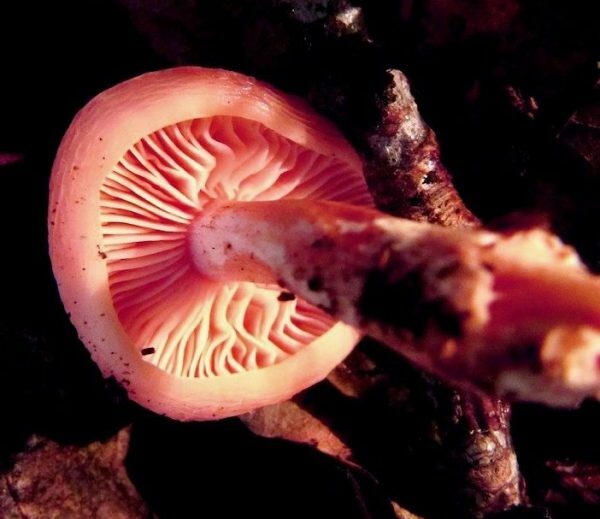 The gills are a slightly lighter pink than the cap, moderately well-spaced and interconnected near the stem, while the spore colour is also pink. They are of the type described as ‘sinuate’, which means they are not quite free of the stem, nor are they connected (‘adnate’) or run down the stalk as with a chanterelle (‘decurrent’). 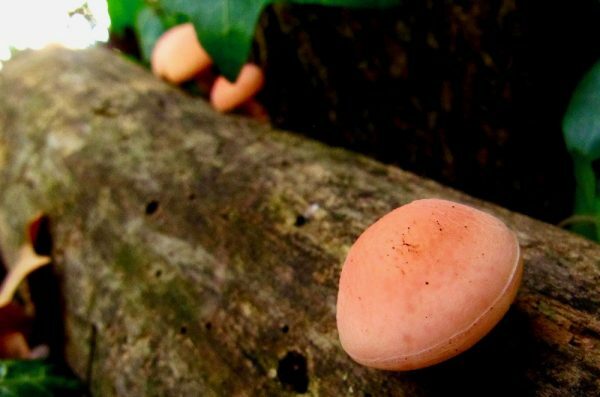 The stem is a paler pink than the cap, slightly mottled, and anywhere from 2-7cm in length and 8-15mm thick, obviously rather depending on the stage of the fruiting body’s growth cycle. There is no ring or volva (the egg-shaped cup the mushroom grows out of that is a distinguishing feature of the Amanita family). 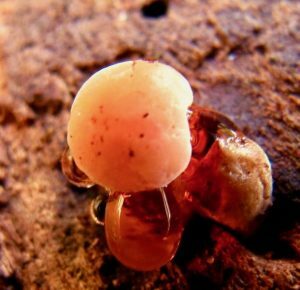 None of this is visible during the earliest stages of fruiting, when it appears like a small round pink jellybean, but at this stage it can be seen exuding red or orange-coloured droplets. This “weeping” is known as guttation, and persists throughout the life of the fruiting body, usually appearing on the stem. The Wrinkled Peach is certainly not the only fungi to do this. One only has to think of the gory blood-red droplets that appear when you cut into a Beef-steak fungus (Fistulina hepatica). It seems unclear why certain species do bleed colourful exudates like this, although you can read more on the phenomenon on the Weird and Wonderful Wild Mushrooms blogspot . As far as the Wrinkled Peach is concerned, these droplets certainly help narrow things down for the purposes of identification. Sources seem to vary as to the other defining characteristics. Roger Phillips describes the stem “as covered in white fibrils”, which one should be able to detect in some of the pictures here. Evans and Kibby observe that the stem often meets the cap slightly off-centre, while Harding says it “is often curved”. 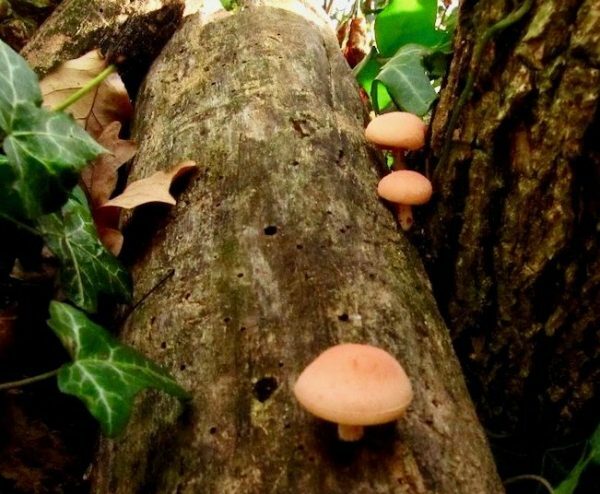 Both of these seem symptomatic of the fact that this mushroom grows on fallen broadleaf trunks and branches - in other words, often from the side of a cylinder and so sideways and outwards before upwards. 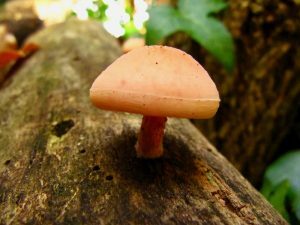 The species is now on the Global Fungi Red List and considered an endangered species across much of Europe, making it a criminal offence to pick in some countries. The default advice for the UK, as with any fungi, is to look, not to touch and to photograph, not to pick. There isn’t really much reason why one would want to pick them anyway, as despite the appetisingly peachy countenance encouraging such opinions as Evans and Kibby’s, that “it smells delicately fruity, likened by some to peach or apricot”, the Wrinkled Peach is considered inedible, if not poisonous then at best pretty unpleasant to the palate. Nevertheless, the rarity and unusualness of this eye-catching species make any encounter with it a cause for celebration, and I would concur with O’Reilly’ assessment of it as “a strong contender for the title ‘Most Beautiful British Mushroom’ ”. If anyone can think of a better candidate, we’d love to hear it.